orchestra | Hire a UW-Madison Musician! The Rockford Symphony Orchestra is located approximately 1½ hours west-by-northwest of downtown Chicago and offers approximately 45 services per season. *Maximum Travel Stipend is $50/service Scale rates and travel are scheduled to be updated for the 2015-2016 season. The deadline to apply for auditions is TUESDAY, JUNE 2, 2015. Maestro Productions, Inc., has announced orchestra positions available for their Madison Area Community Christmas Festival featuring local talent at the Middleton Performing Arts Center on Saturday, December 20 (2pm & 7pm) and Sunday, December 21 (2pm matinee only). Rehearsals are on Sunday, Dec. 14 and Friday, Dec. 19, in the 6-9pm time frame. Violin 1/2, Viola, Cello, Double Bass, Flute 1 & 2, Oboe/English Horn, Clarinet 1/2, Bassoon, Trumpet 1/2, Trombone 1/2, and French Horn 1/2. The event will feature a large massed Christmas Festival Choir presenting a fully orchestrated cantata with orchestra and handbells, as well as, Christmas Carols and other seasonal choral/orchestral favorites. The orchestra will also be featured in several selections. There is no formal audition to participate, however, instrumentalists will be asked about their experience level and current performance groups/activity. Music is intermediate/advanced level. To apply for an orchestra position, and receive full details, please e-mail Mark Bloedow at musicdirectormeb@gmail.com, visit Maestro Productions, Inc. on Facebook, visit www.maestroproductions.org, or call (608) 845-3952. You will receive a reply. The Wisconsin Youth Symphony Orchestra (WYSO) is looking for interested candidates for the Administrative Assistant position. Applicants are asked to email a resume and cover letter to Executive Director, Bridget Fraser, by Monday, July 22, 2013. 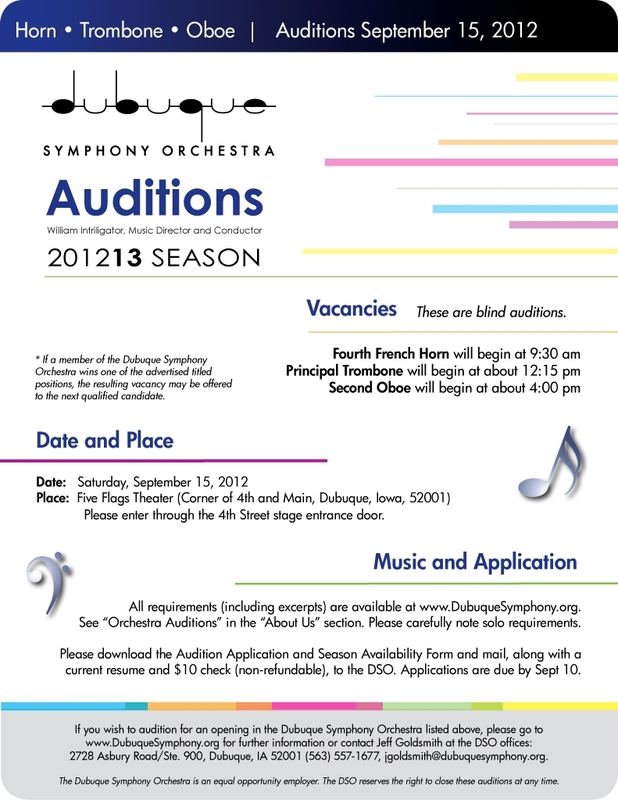 Materials may be emailed to bfraser@wyso.music.wisc.edu. A link to the position description is also available on our website at http://wyso.music.wisc.edu/about/employment/. Local conductor looking to hire a string quartet to form the basis of a new repertory orchestra. Applicants should be interested in expanding into a full orchestra with an interest in orchestral music and a willingness to help recruit other players. Compensation for weekly rehearsals can be negotiated and a meal will be provided at each rehearsal. Interested groups should contact Jacob Kallman at jk@jacobkallman.com for more information or call 201-739-7682. Volunteers are needed for the pit orchestra for Stageworks Projects production of “Oliver!”. June 23, July 14 and August 4 (sitzprobe). Additionally, we would have two dress rehearsals on August 8 and 9 with performances on August 10, 11, and 12. All rehearsals and performances will be at Stoughton High School. Note: the School does not endorse or guarantee any services resulting from announcements made on our blog.